Perhaps best-known of the group is Father Varghese Payapilly, founder of the Sisters of the Destitute (SD). Fr. Varghese Payapilly was a diocesan priest of the Archdiocese of Ernakulam. In order to serve the poor, the destitute and the aged often forsaken by their dear ones or driven out into the street, he started a religious congregation in 1927, later called as the Sisters of the Destitute. Years after his rather premature death, his memory lives on as a priest who led an ascetic, charitable and exemplary life of apostolate, according to the congregation. Today the congregation runs numerous institutions serving those in need in India, including homes for the elderly and disabled, schools, and hospitals. 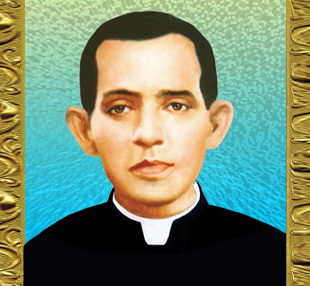 Father Emanuele Nunes Formigão, a diocesan priest, founder of the Congregation of the Religious Sisters of the Reparation of Our Lady of Fatima; born in Tomar (Portugal) on January 1, 1883, and died in Fatima on January 30, 1958. Father Ludovico Longari, a member of the Congregation of Priests of the Most Holy Sacrament; born in Montodine (Italy) on June 20, 1889, and died in Ponteranica (Italy) on June 17, 1963. Sister Elizabeth Bruyère, Foundress of the Congregation of the Sisters of Charity of Ottawa; born in L’Assomption (Canada) on March 19, 1818, and died in Ottawa on April 5, 1876. Mother Margherita Ricci Curbastro (born: Constance), Foundress of the Congregation of the Handmaids of the Sacred Heart of Jesus in Agony; born in Lugo di Romagna (Italy) on October 6, 1856, and died there on January 7, 1923. Mother Florenza Giovanna Profilio, Foundress of the Institute of the Franciscan Sisters of the Immaculate Conception of Lipari; born in Pirrera (Italy) on December 30, 1873, and died in Rome on February 21, 1956. Mother Maria Dolores of Christ the King (born: Maria Di Majo), Foundress of the Congregation of the Missionary Handmaids of Christ the King; born in Palermo (Italy) on December 16, 1888, and died there on June 27, 1967. Sister Justa Domínguez de Vidaurreta and Idoy, Superior of the Spanish Province of the Society of the Daughters of Charity of Saint Vincent de Paul, born in Azpeitia (Spain) on November 2, 1875, and died in Madrid (Spain) on December 18, 1958.